How Can Your Business Cope With An Uptick in Sales ? How Can You Use Merchant Services? What to Look For in a CCP Company? The holidays are for seeing loved ones, and letting your diet plans and waistline cascade into oblivion. It’s also the absolute peak of the year for retail in all shapes and sizes, in-store and online. Holiday retail sales in November and December are expected to increase 4.3% - 4.8% over 2017, to an eye-popping $720.89 billion. At the center of the retail extravaganza is of course Black Friday, when pie and turkey hangovers fuel mass shopping with or without your cousins in tow, angling for deals—and breathing room—in the checkout line of the big box store of your choosing. You probably heard though that Black Friday isn’t the only day for mass retail distraction, and in recent years, “Cyber Monday” has meant billions of dollars in online sales on the Monday after Thanksgiving. It’s all part of a holiday season in which sales are expected to top $1 trillion for the first time ever. This means not only an insane amount of wrapping paper to throw away and thank-you cards to write, it is also an amazing opportunity for online retailers to cash in, if they’re prepared. These days there is a long list of companies that specialize in what is commonly known as “Merchant Services.” A rather broad term, it includes companies that handle credit card processing (CCP) for retailers large and small, helping keep these businesses running smoothly even when sales reach a fever pitch. While your company is responsible for providing the product, the merchant services provider (MSP) carries out the credit card transaction online and handles security on both ends to protect you and the buyer. The MSP is responsible for ensuring that the purchase will go through, and if most of your purchases are carried out online, you’ll want to open an online “payment gateway” where the credit card processor can authorize and handle online sales. When your online sales take off—like during the holiday season—a reliable top CCP company can ensure that all your transactions go through quickly and securely, and your business stays a well-oiled machine. First things first, a merchant service makes handling credit card purchases easy, and if you’re running an Ecommerce site, this is key. These companies also provide tools to help you manage your Ecommerce site from your mobile device. Merchant services can include complicated sales reporting, which can help you get a bird’s eye view of your sales and help you keep track of which items are performing well, which should be prioritized, and which you might want to scrap. Advanced reporting tools can also help you keep track of inventory if certain items are flying off the shelves. Merchant services companies can also implement customer reward programs, so you can provide incentives for repeat customers, and also make special holiday discounts for Black Friday and Christmas that can take your sales to the next level. Some merchant services can also integrate with email marketing companies, to help you target customers and improve your company’s word-of-mouth, before, during, and after the holiday season. 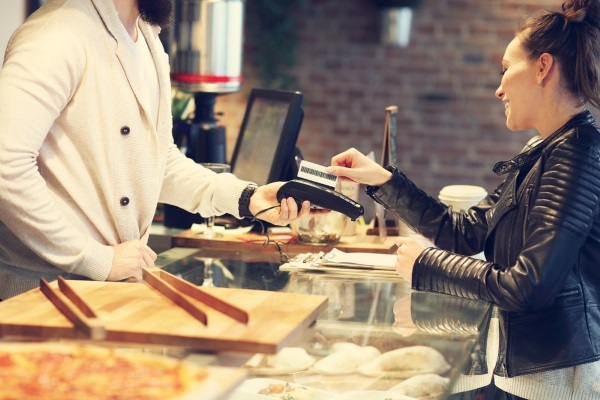 Not all credit card processing companies are created equal, so make sure to look out for a few key factors when deciding which one can help you during the busiest time of the year. This is perhaps the main deciding factor—at least when it comes to your bottom line. Fees can vary from a flat charge + a percentage of the sale, to solely a percentage of each sale. The percentage can be as low as around .15% to around 1%-2% and usually around the flat charge is around 20 cents. Most companies have a higher rate for online transactions, so if the lion’s share of your sales will be online, this can be a significant consideration. Also, with some providers, you’ll only receive a certain transaction rate only after passing a certain volume of sales, so it’s up to you to determine if your company will meet this threshold, and if it will pay off for you. With most providers you will also be expected to pay statement fees for the printing and mailing of your credit card statements—usually around $5-$15 per month. This is in addition to a monthly payment gateway fee for processing sales. Most merchant services providers can help you run customer reward programs, including special deals which you calibrate as you see fit. This is a great way to build customer loyalty and also boost sales through well-timed offers, especially during the holiday season. For a business, one of the more beneficial aspects of using a merchant services company is the ability to get a comprehensive, data-driven look at your business and how and where it’s succeeding. Make sure to look for a company that can help you crunch the numbers, so you can see where to focus your sales and where your strengths and weaknesses are. Chances are you won’t be running your online business solely from a front office. You’ll need the ability to stay on top of things no matter where you are, and a service that’s mobile-optimized is key. Ideally this means the company will also have a mobile app, and will allow customers—and you—to have the same type of user experience no matter what device is being used. There are a number of other factors to consider before making your decision. Security is key, so make sure that the company has serious safeguards in place to protect you and your customers’ data and personal information. You should check how binding the contract is. Are you able to cancel anytime or is there a minimum length of contract? If you cancel early will you be charged? In addition, does the company deliver the funds at prompt, regular intervals. Also take a look at how long the company has been in business and try to gauge its reputation with customers. The holidays are upon us, so if you’re feeling a bit stressed about what to buy for all your loved ones—or just about gathering with all your loved ones—then you are by no means alone. For business owners large and small though, the holidays are both a blessing that can keep a company in the black the rest of the year, and a logistical challenge that can have you breaking out the egg nog well before noon. A merchant services company can definitely make things easier, so read reviews of the best CCP providers around, and find the one that sounds just right for you.